Minoura Iron Works in Japan is one of the traditional family-companies in the bicycle related business. Since 1933 the family Minoura has been pushing their designers for new products and product-improvements. This year’s additions to the product range are the repair stands and the wheel truing stands for the bicycle-workshops and mobile track-workshops. 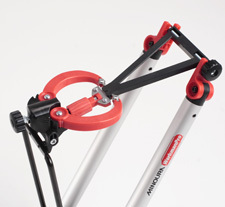 This portable wheel truing stand features Minoura’s auto centering system. ACS allows the user to perform almost every procedure needed in building a wheel without the need for an additional dishing tool. Also, newly designed gauges that check vertical and horizontal movement of the wheel are intuitive and easy to use. The True-Pro can be folded down completely for easy transport and storage.